December 17 2018, 4:58 a.m.
you should summon supes and hulk for their opinion. Israel is the incorrect name for that country. I have not heard any of them profess that the other eleven tribes have returned. How can they say that they may return back to that land when there are no Levites to represent their claim? I see only Sephardic and Khazarian mixtures of the tribe of Judah who murdered palestinians and built settlements on top of their graves. Therefore if we want to judge them by their own history and rules they should be called Judah not Israel. Furthermore that star on their flag is not the Magen David it is the symbol of Rothschild and also the symbol for the god Moloch. I see only one tribe Judah and a diluted version of the original tribe. They don't practice the tanakh, the majority of them are secular and do not even follow their professed beliefs. It does not accurately represent the tribe that has taken over that land. They should change the name of the country to Judah and limit the amount of land they control to the original tribal boundaries alotted them by inheritance. Since they want to be an ethnocentric racist tribe who think that God gave them that land then let's be fair and give them what is their fair portion of land using their own rules. 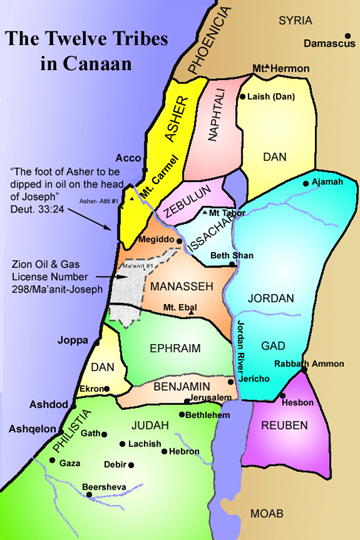 Here are the tribe of Judah's original boundaries. The true Hasidim have condemned what has been done in Palestine on May 14, 1948. The leaders of Israel are full of yetzer hara. May the true Israel be rebuilt someday. can someone translate religious babble nd insanity into english? the way things are going this just feels like such a tiny issue. That's wild, but it is a good reason to always read the fine print, and that is exactly why companies show those long forms that nobody reads, because nobody reads them, you could sign your soul away and you wouldn't even know it. Good for this woman though. Not religious babble, Israel has been killing Palestinians and pushing them out of their homes for a while now. We could get into how most major news sources and banks are owned by a select group of people, and or how the federal reserve a fairly taboo topic is ran by the same people also. A quick google search can give you this information, it's quite creepy actually. The last news source that was not owned by said religion was fox news, which was just bought by Disney =). Further consolidation of our tv programming, and a further consolidation of power over the people. I'm Atheist, so don't lump me in with all that lol. A simple google search can find you this information. Not religious babble, Israel has been killing Palestinians and pushing them out of their homes for a while now. The thing is that it's not an either/or. Creating asinine rules in the US about "Pro-Israel Oaths" that take away people's liberty and freedom does nothing whatsoever about what's happening in the Middle East. This is why I highlight these kinds of issues and surface them to people. What other thing is weird and distracting ? the shouldn't be called israel part seems like a distraction from the israel goverment does bad things. The messed up part of this story is the teacher is palestinian, and is being forced to support a nation that she watched first hand murder her own people and violate international laws. Now AIPAC lobbyists are making it illegal to criticize Israel and USA gives them over 4 billion a year. Welfare country. - I'm confused. What is this business' connection with Israel? The founder of the school or philanthropist involved is pro-Israel ? Cuz this would be as bizarre as Ikea making you sign a pro-Sweden oath to work there? actually nit picking the small things takes away focus from larger issues, it actually is an either or scenario, there is only so much money to spend on programs, so much effort that can put into local and foreign affairs, and only so much time in a day for protesting and reform efforts. after awhile all the nit picking about largely menial and tiny things is just diverting attention away from other issues, do I think the teacher should of been fired, HELL NO, it's the antithesis of every principal I have to do with freedom of opinion, I just have trouble putting it at a priority at least until she loses in the supreme court, I hope someone represents her and she wins in court because she needs to sue that school, which should occur easily enough. you are correct that if it was between these two issues that were mentioned it would not be an either or scenario as these are only two issues, but let's not pretend these two things are the only things going on in the world right now, and this is nothing more the wrongful termination case, one not unlike any other that occurs just about every day. These are actual laws being debated and passed by politicians. So, in fact, time and money is ALREADY BEING SPENT on making these things law so that this happened. It's true that budgets and priorities have to be established, but pretending that there aren't millions of people and trillions of dollars going towards hundreds of thousands of different things already is silly. There are a lot of us, and a lot of money, and a lot of time. We can care about a lot of things at the same time. You also have to consider locale and expertise. Just because X or Y is "more important" by some measure doesn't mean throwing more people and money at it is going to make a difference. At the same time, it's perfectly fine for different people to care about different causes. We don't need everything to think the same. The idea that just because you don't think a cause is worthwhile enough it becomes "nit picking" is asinine and unproductive. Different people in different positions have varying amounts of impact they can assert to different causes. The value of a single unit of a particular resources are not equal in all situations. No one is pretending is these are the only things going on in the world. You are the one who decided to inject the middle east into this conversation as though it had any relevance whatsoever. This is far more than wrongful termination when these things are becoming laws in various states, and the fact that it also impacts disaster relief is lubricious. If you think this is just wrongful termination you really don't understand what is happening and should probably not talk about this subject. Attacks on civil liberties by the government should never be ignored or considered nitpicking. Stating like it's fact doesn't actually do anything to convince me you are right. 3)i disagree, not with your point but your conclussion, millions of people spend trillions of dollars on thousands of different things....that's true, and what comes of it from the perspective of change? Not much, hard to get much done with the focus split so many different ways and with a system that slows change to a snails pace. 4)isn't this point meaningless. You have two points. 1 that my opinion is asinine and unproductive, while preceeding that comment by saying we don't all need to think the same(lol)...anyway that is your opinion and thus i can say the same about it, and if we consider this a valid arguement I can disregard it as easily as you do mine...point 2) a comment on allocation of resources...it's a statement, but not really reflective of reality more money and resources can more often solve problems than the scenario you put forth, you are right that there are times that it's not true, especially in arenas other than government...but why are we talking about it? 10 million people in unison will force the government to change much faster than 10 million individuals with 10 million different problems. It's how the world is. 5) yes because i think your op is nothing more than meaningless wrongful termination case that would easily be won in the supreme court. 6)states can pass laws but if impedes on a citizens constititional rights the supreme court will shoot it down, once a case reaches that level and the laws will be proven unconstitutional and require change, if it happens that the supreme court sides with the law than i'd be interested at that point, but not until then. That said please point me to these laws. I would like to read them. To be quite frank I don't believe you. So much hyperbole gets thrown around nowadays i'd just lije to see them myself. 7)I don't deny their is a problem it's just an easily resolved one...if the schools start getting sued this would get wrapped up right quick....it happened when they attempted to lock free speech to safe spaces, it happened when they tried to fire teachers for religious beliefs, etc, etc, etc, and it would happen with this. Did you even read the article you are talking about? This isn't a single school board deciding something. This is something passed by the state legislature. Since you can't be bothered to actually educate yourself on the stuff you wish to talk about, I will show you. As we saw with bills like SOPA, without widespread public outcry, these kinds of thing can easily become law. You also overestimate how easy it to get a case to the Supreme Court. Out of ~7000 cases per year, the Supreme Court hears just about 80 cases, and they almost never hear cases that haven't already been tried in a lower court. That said, I'd agree with you that the SC would rule against this ordinance if it came to that, but it's not like the SC hasn't surprised me before either. In general, however, loyalty oaths and other similar measures have generally been struck down. It doesn't stop states from continuing to try and implement these though. In the 1950s, there were many states that enacted "US Loyalty" oaths, primarily targeted at communists. The Supreme Court threw out many of these, but during the few years the laws were in place they were quite disruptive to many people's lives. Interestingly, many of these were struck down for violating the 14th, and not the 1st, Amendment. However, in 1952, the SC did affirm a decision to fire Irving Adler from the public school system for having had association with the Communist party. It would not be until 1967 that a different cases would functionally reverse that decision. Too little, too late for Adler though, obviously.